Councilman Alex Mendez landed the top spot on the mayoral section while Zellie Thomas is number one on the council at-large portion of the May municipal election ballot. Both men received the top spots following a lottery at City Hall on Monday morning. Mendez was the highest vote-getter in that school board race, he said. His position is 1A on the ballot. He is followed by Andre Sayegh (2A), Pedro Rodriguez (3A), Alex Cruz (4A), Michael Jackson (5A), and William McKoy (6A). Being number one also helps to minimize possible confusion between the two Alexes in the race for Mendez. Cruz’s residency question remains unresolved. More evidence emerged on Monday that Cruz does not reside in Paterson. His two children attend the Passaic Valley High School. Cruz was present at the ballot position lottery. Jackson said people are paying close attention to the May races. Sayegh agreed with Jackson. “Ballot position is immaterial in the mayor’s race,” said Sayegh. He said it matters in local races if the candidates are running in the November general election. Former mayor Jose “Joey” Torres was third on the ballot in 2014 and won. Thomas was not present at the drawing. He spoke over the phone when reached by a reporter. Thomas’ name will be the first one voters see when looking at the names of the 14 people running for three available at-large seats. He is 1B on the ballot followed by Douglas Maven (2B), Lilisa Mimms (3B), Maritza Davila (4B), Mohammed Akhtaruzzaman (5B), Bernard Jones (6B), Kenneth McDaniel (7B), Casey Melvin (8B), Flavio Rivera (9B), Aslon Goow (10B), Juan “Mitch” Santiago (11B), Fatima Bell (12B), Angela Muhammad (13B), and Davon Roberts (14B). “Hopefully, I get votes for what I stand for,” said Maven. He said he is not sure whether being second on the at-large portion of the ballot will garner additional votes. Rivera said position does not matter. What matters is campaigning hard to build name recognition, he said. Four years ago, Davila, the sole incumbent running this time, was first on the ballot. She finished third. 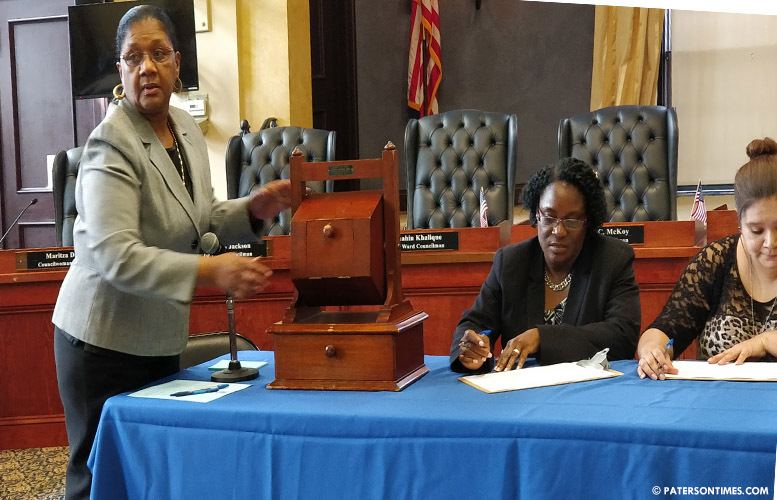 City clerk Sonia Gordon (pictured) and her staff inserted the candidate names in small cubes and put them inside a classic wooden raffle drum. She then gave the drum a spin and pulled out names. There were some cheers and hugs in the chambers as the clerk announced the different ballot positions for the candidates. The election is scheduled for May 8, 2018.